After going to Wondercon on a whim, I was pleasantly surprised to find that Nintendo of America had set up a booth in the dead center of the exhibit hall. Their booth was centered on the 3DS and its upcoming games, while the WiiU was unsurprisingly a no show, Nintendo having said they’re saving it for E3. Besides a handful of downloadable titles, there were three different yet to be released games on the floor. Spirit Camera was an odd game that focused on the use of the 3DS camera to make the settings around the player scary and weird but it came off as a little gimmicky. Kid Icarus held a spot in a majority of the 3DS’ cartridge slot with both multiplayer and single player stations. I played a bit of that, but the game comes out March 23rd so I felt like playing a game that was a bit farther off. 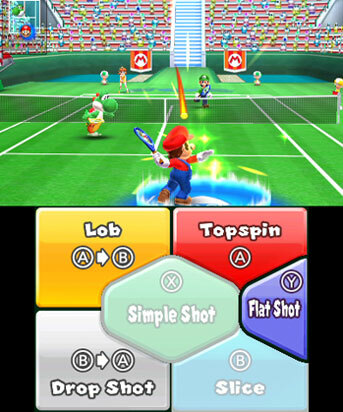 Mario Tennis Open seemed to fit that bill and from what I played so far it looks pretty promising. The series has always been my favorite of the Mario sport spin offs and the 3DS version looks to make a few changes from its predecessors, but still keep the core mechanics that make the series work. A lot of the different shots are still in the game from previous versions, but now players have different options on how to execute these shots. 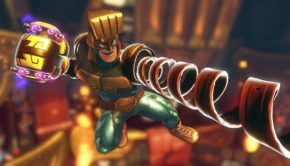 The same way Street Fighter 4: 3D simplified some player’s moves to the touch screen; certain shots can now be executed with a tap of the finger. I found this strange considering that special tennis moves only require two button combinations and are not hard at all to execute in a match normally. Maybe this is just for the touch screen to be used in some way or to appeal to casual players who really only like pushing one button at a time. So I can reach over and press all the same buttons on a touch screen instead of using the physical buttons!?? 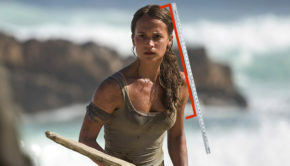 Another interesting element that uses the 3DS’ capabilities is the use of the gyroscope. If a player wants to get a different over the shoulder perspective of the field, then all they have to do is simply tilt the 3DS down and the camera swings to compensate. It’s a neat little feature, but doesn’t seem to affect gameplay too drastically. In the version I played, a ground icon glowed in certain spots where if the ball was smacked with a simple shot, the ball would react differently depending on the icon. 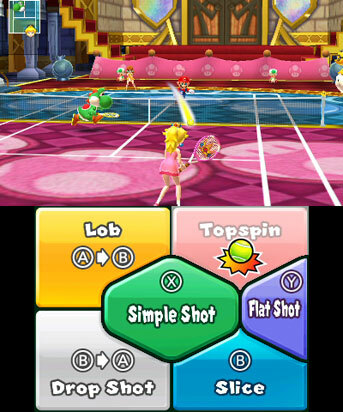 The star launched the ball ridiculously fast and the flower made it fly around the court in an obscure direction; both make it harder for the player to hit on the receiving end. I really dug this feature and thought it could play into the arcady nature of the game very well. 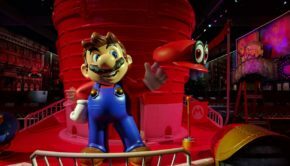 The colorful cast of Mario characters each with their own unique play style is present along with the inclusion of the Mii character of your choosing. Supposedly your Mii can be upgraded and is customizable and can be traded to other players via street pass functionality. 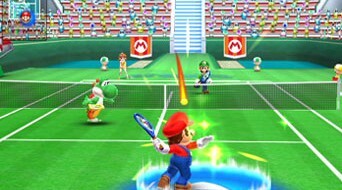 Set to hit stores the 20th of May, Mario Tennis Open seems to have the tight and fun gameplay that its predecessors had and could potentially be the best in the series. We will just have to wait and see if the 3DS can have another winning Mario title on its hands.